No one who visits Graceland Cemetery in Chicago can fail to notice Lorado Taft’s “Eternal Silence,” the statue of a hooded figure that stands over the plot of Dexter Graves and his family. Even official documents from the US Department of the Interior describe it as “eerie.” So iconic is the image that in 1968, Claes Oldenburg even drew up a proposal for a skyscraper on Michigan Avenue that would look just like it – imagine how eerie a one thousand foot version would be! (Oldenburg was probably just being fanciful with the design). It would be a failure of the citizens of Chicago if there weren’t any strange legends about it, although, frankly, the ones we have leave a bit to be desired. Some say that you can’t take a focused photograph of it (which was probably a better legend before digital cameras made it easy to disprove), and others still say that if you look into its face, you will see your own death (a good legend that, again, is simply too easy to disprove). Even most of the more factual information about it that has been published is a little inaccurate, and leaves out a lot of interesting stuff about the Graves family. For one thing, nearly every article about it says that it was commissioned by Henry Graves, Dexter’s son, in 1909, which is a little inaccurate, since Henry had been dead for two years by then (it was probably by Henry’s cousin, also named Henry Graves, who was one of two executors of the estate). And it’s seldom mentioned that Dexter (and a few of the other family members) died over a decade before the cemetery was even founded – they would originally have been buried in the City Cemetery where Lincoln Park is now. What sort of plot they were in there, when they were moved, and whether anything marked current the lot before the statue is not currently known. Henry had no children of his own, and no more bodies were added to the plot after his death. Could it be that Dexter lay in an unmarked grave (or two of them) for seventy-five years before the statue was built? Dexter Graves was an early settler in Chicago, setting up a hotel known as The Mansion House in the loop; it’s a bit of a footnote in Chicago history for having been the site of the first professional theatrical performance in the city (by some measures). His son, Henry, was ten years old when they moved to town in the early 1830s (after a perilous journey with Captain Naper, the namesake of Naperville). His own early adventures are worthy of a post of their own. Around the time Dexter died in 1844, young Henry built a cottage for himself on 31st street near Cottage Grove (it was he who gave “Cottage Grove” its name), at a time when that would have been little more than dunes on the beach. But times changed. I believe that every researcher who’s ever looked up a map of Camp Douglas, our Civil War prison camp, has seen the site marked “graves” and assumed it was a camp cemetery, perhaps for cholera burials (I sure did). But it was really the Graves homestead – Henry refused to give up the land, so he and his family simply lived in a house with a POW camp bordering it on three sides. 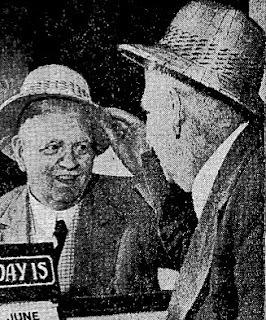 By 1905, Henry was being advertised as the “oldest Chicagoan.” Though there were a few other contenders, it is quite likely that no one else still in the city had been in town longer than he had. When he died in 1907, his will contained the provisions for the new plot at Graceland, but reading the will raises more questions than it answers. The will did not call for a statue, but a family mausoleum that would be built at a cost of $250,000. That’s several million in today’s money, so we’re talking about one serious mausoleum here. 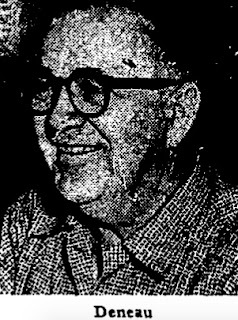 Elsewhere in the will – a portion that attracted far more press – he also set aside $50,000 for a monument to Ike Cook, a race horse that he may (or may not) have once owned, and who broke a record with a two minute, thirty second mile. The monument was to stand in Washington Park, and would feature a bronze statue of Ike Cook, plus a drinking fountain for horses. Model for the “Ike Cook” statue Graves paid for in his will. The task of designing to horse monument fell to one Charles Mulligan, and the plan even survived a legal challenge over whether the gift to the city was taxable or not, and a photo of a model for it was published in newspapers. However, as near as I can tell, the statue never came about. Front-view of the “Father Time” figure in Taft’s “Fountain of Time,” built roughly on the spot once reserved for Graves’ monument to his favorite race horse, and designed not long after Taft did “Eternal Silence.” From wikimedia commons. Eventually, noted sculptor Lorado Taft was brought onboard to build the monument; plaque with roughly (though not exactly) that text is on the back. Taft’s work can be seen all over the country, including several statues around Chicago – perhaps most notably the 1920 “Fountain of Time,” which features a similar hooded figure (more explicitly “Father Time” in this sculpture, whereas the identity of the figure in the Graves monument is a bit ambiguous). Interestingly, that “Fountain of Time” stands almost exactly in the spot where the statue of Ike Cook was supposed to be. The city first commissioned Taft for the fountain in 1913 – could the similarities in the figures be a result of the city having used some of the Graves money? No connection seems to have been noted at the time, but it sure seems like there’s a missing piece of the story here someplace. I’m assuming that Graves already owned the plot at Graceland, and that his family members from the old City Cemetery had been moved ages ago. Eternal Silence is a great work by a sculptor who was very famous, but I can’t imagine it cost $250,000. There must have been money left over. This is one for my “learn more” files, and another story to tell on cemetery strolls. Full view of “Fountain of Time” from wikimedia commons. Did this evolve from plans for a drinking fountain for horses? David Kennison: Boston Tea Party Vet or Early Chicago Fraud? Plenty of bodies besides that of Ira Couch are still in Lincoln Park, which was once City Cemtery, but only one of them besides Ira Couch still has a grave marker there – David Kennison, one of Chicago’s first great con artists. Kennison was an old man living in the care of the William Mack family (or Henry Fuller, depending on which source you’re reading) when he came to Chicago in 1848. At the time, he claimed to be 111 years old, and that, while he was mostly bedridden, he could still get up and walk 20 miles in a day if he felt like it. He further claimed to have been the last surviving participant of the Boston Tea Party, and bequeathed to the historical society a small vial of tea leaves that he swore were from the tea party itself – the Chicago Historical Museum still has a box of tea leaves with a signed note from Kennison today. But his participation in the Boston Tea Party was the only the beginning of Kennison’s story. He further claimed to have been present at the Boston Massacre, the Battles of Bunker Hill, Lexington, Brandywine, and just about every other major battle of the Revolution, up to and including Cornwallis’s surrender at Yorktown. And, even though he was in his mid-70s when the War of 1812 broke out, he had fought in seven battles in that war, as well. He even claimed to have been at Fort Dearborn for a while. The story was awfully farfetched, but Chicagoans ate it up. When he died in February of 1852, hundreds attended the funeral at Clark Street Methodist Church, a military band (his favorite kind) accompanied the funeral procession, and he was buried with full military honors in City Cemetery. The local Daughters of the American Revolution named their chapter in his honor, and a generation of Chicagoans considered him one of the greatest heroes of the city’s pioneers. After the cemetery was moved, Kennison’s body was left, but the marker disappeared. In 1880, the Chicago Tribune launched a search for old-time residents who had attended the funeral and could remember exactly where he was buried. Those who were still present were able to pinpoint the spot within a few feet at a spot just North of the Couch tomb, and a flag was raised on the spot until a more permanent monument could be erected. Today, a large granite boulder stands on the spot within a few feet of his burial place with an aluminum plaque listing his accomplishments. (added paragraph): According to some terrific research done by Pamela Bannos, the city’s resident expert on City Cemetery, they put him in the wrong spot. 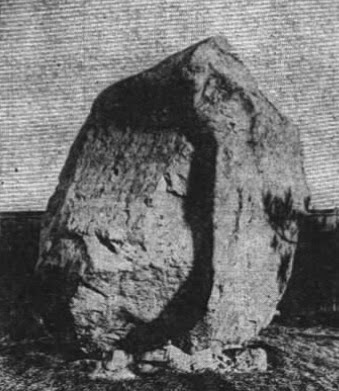 The boulder was placed on the site where the funeral services were held, but the actual burial was a few days later, near the site of the Couch tomb. Actual burial services were seldom attended in those days – you have to remember, City Cemetery was a very early example of a “garden” cemetery. Most people buried in large cities were buried in crowded churchyards, where the stench was thought to be hazardous to one’s health, and where every turn of the shovel was likely to turn up something unpleasant. This wouldn’t have been nearly as big an issue at City Cemetery as it was in churchyards, but burial services were not exactly customary yet. 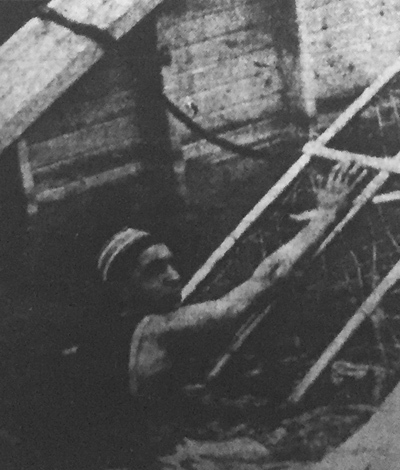 Kennison’s remains were placed in a vault for a few days after the cemetery, then buried in the grounds. Several official city sources still speak of Kennison as a hero of the Revolution, but this only speaks to his real skill – Kennison was one of Chicago’s first great con artists. Throughout his time in Chicago, he took several opportunities to use the story of his life to hit people up for donations. But the story was just that: a story. At the time of his death, researchers have now learned, he was actually only in his mid 80s. Any historian who gave his stories even a cursory glance had known that they were full of holes since at leat the 1910s, and by the end of the 1970s historians had determined that his stories of being a Revolutionary War hero were entirely made up. 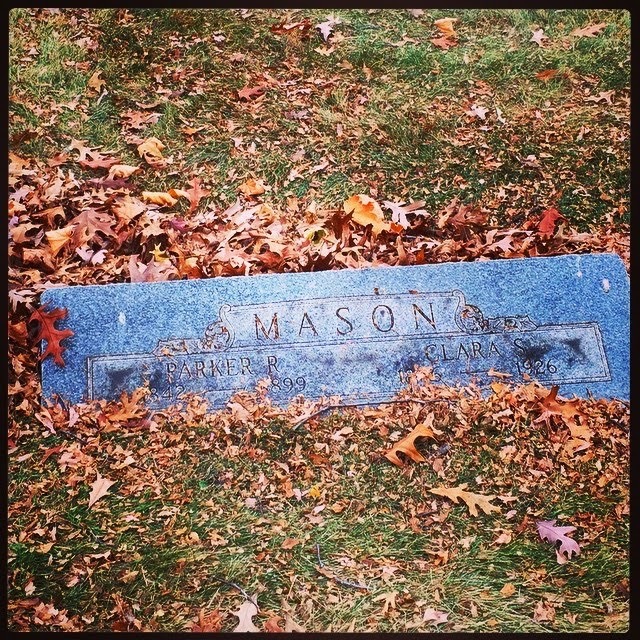 coming tomorrow: a bit about the only actual Revolutionary soldier thought to have been buried in Chicago proper…. When the Wind Blew Inn, a bohemian tea room, was raided on February 13, 1922, the police arrested 40 patrons, as well as Lillian Collier, the owner, and Virginia Harrison, who was variously described in the press as Lillian’s aid, assistant, partner, employee, or sister (some modern commentators have assumed that “aid” was code for “girlfriend.”). 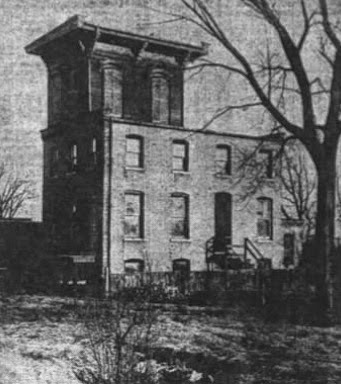 They were both listed as living in the same building as the tea room, though by April Lillian’s address was given as 545 N. Michigan, around the corner from the place. Between Feb 13 and April 21, the place was raided several times, and Lillian (who claimed to be friends with Mayor Thompson) successfully received a writ banning the cops from interfering with her. Lillian took to complaining that “cops are here oftener than customers.” “They simply come in droves;” she told the Journal. “And it is hard to distinguish between them and guests, except that the cops….never take off their hats. My! I nearly insulted a customer a while ago. An absent-minded old gentleman sat down without removing his hat. I told him, ‘if you cops’re going to hang around here you’ll have to eat and be merry and take off your hats!’ My, but he was indignant! ‘Madam,’ he said – and I just hate to be called ‘madam’ – “madam, you confuse me.’ Of course, I apologized and told him my latest joke.” She told a judge that she ran a strictly decent place, and that she believed it was the finest restaurant ever built into an old gasoline station (Though later patrons admitted that the 75 cent cups of “tea” were not really tea). Cops certainly did make trouble, and teased her in court, saying that they used only candle-light because it “saved on dishwashing costs.” A few cops were said to be laughing when the place burned down in April, 1922 (Lillian opened a new, slicker version right next to the police station on LaSalle to save them the trip, but it wasn’t a success – it was too “nice” for the bohemian crowd). One paper said it was Virginia Harrison who told the judge “There is no snugglepupping at the Wind Blew Inn,” the most famous line from the whole affair. 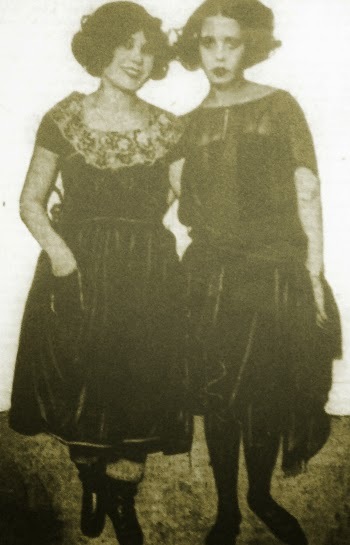 She was often photographed alongside Lillian, and was her co-defendant at the bizarre trial in March, 1922, when the two of them were sentenced to read a book of fairy tales to cure their bohemianism. A few weeks later, The Wind Blew Inn burned down. The Tribune said that Lillian blamed puritan arsonists. In other papers, though, she seemed to be putting the blame on none other than Virginia Harrison! It seems that in the weeks that followed their strange sentencing, the two of them had a falling out of some sort. By April 21, the night of the fire, Virginia was described as a disgruntled former employee who had been heard making threats, and who may have even been seen around the place with a can of gasoline. 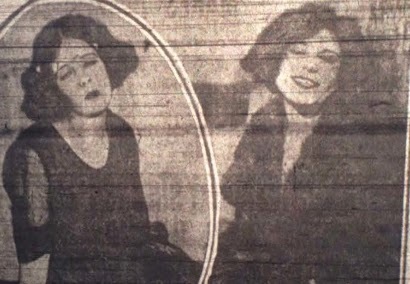 Lillian herself was brought in for questioning, but when it turned out she had no insurance on the place, she was absolved of all blame, and police began to focus on looking for Virginia Harrison. Here her story seems to end. I’m not sure whether they ever found her or what. One paper said that she was also known as Jean Lawrence (whether that or Virginia Harrison was her real name is hard to guess). Either name is common enough that she’s pretty hard to trace. So what became of her? Was she Lillian’s girlfriend (or trying to be?) I can imagine a scenario in which she was in love with Lillian, but Lillian wasn’t actually into girls, and Virginia torched the place after being rejected… but that’s usually the sort of story that happens in bad TV dramas that risk get boycotted by GLBT groups! Her antics and quotes certainly didn’t attract as much media attention as Lillian’s own did – papers rarely quoted her directly or spoke about her adventures in flagpole sitting, etc. 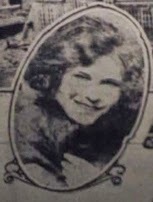 Other than possibly being the source of the “snugglepupping” line (which other papers credited to Lillian), it’s Lillian who gets all the best quotes in the articles, and who was later remembered in many reminisces of Chicago bohemia. Chicago Journal article noting that Virginia was wanted for questioning. Tomorrow, we’ll examine the case of Mildred Bolton, a forgotten murderer that Lillian wrote about in the 1940s under her pen name, Nellise Child! It’s pretty well established now that the skull in the artistic director’s office at the Goodman wasn’t really the skull of comedian Del Close when he was alive, but it’s his now! He donated his skull to the theatre so that he could play Yorick, and the skull they have serves as his, at least symbolically. A fundraiser once offered to show it to me if I donated enough cash, and I finally got to see it over the weekend. We never had a stranger alderman than Bathhouse John Coughlin, who, with his partner Hinky Dink Kenna, controlled the notorious levee district for two generations beginning in the 1890s. Often seen tromping around in a suit made of green billiard table cloth, Bathouse John was often seen as a sort of affable buffoon. Though he and Hinky Dink were running protection rackets that allowed people to get away with some awful things, it was hard not to like ol’ Bathhouse, who generally did as he was told as a politician, but was allowed to amuse himself introducing goofy legislation like promoting the annual “Straw Hat Day.” Newspapers showed shots of him practicing putting his hat on like a big boy. But he may be best remembered as the poet laureate of the first ward. 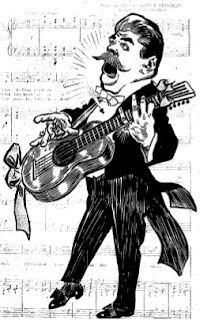 After his first song, “Dear Midnight of Love” (which Herbert Asbury said had all the literary merit of a first grade essay), several “ballads” appeared under his name, with such titles as “She Sleeps at the Side of the Drainage Canal,” “Ode to a Bath Tub,” and “Why Did They Build Lake Michigan So Wide.” Most were actually written by John Kelley, a newspaper reporter, who knew fully well how dumb they were. But if Bathhouse knew, he didn’t say. 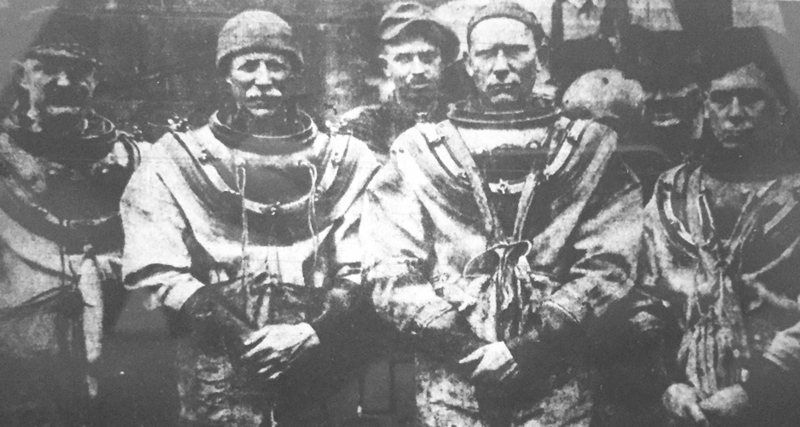 Rather, he suggested that they might be “too deep” for most people. But these tears won’t bring her back. I like you as mulligatawny, noodles, or consommé. I break my bread into the bowl to cool it, don’t you see. Brings customers for blocks around, especially at noon. are not to be considered with a bowl of steaming soup. Clam chowder has its devotees, and I’ll admit it’s fine. Others are fond of “K and K,” but no corned beef in mine. While the carrier gets but two and a quarter. some take to automobiling in order themselves to amuse. There’s nothing to my mind can equal a plunge in a porcelain tub. Some go to ball games for pleasure, others go bobbing for eels. Some find delight making money, especially in real estate deals. But I’d walk forty miles before breakfast to roll in the porcelain tub. Some can find sport on the golf links with mashies that foosle, I trow. O, what in the world is finer than a dip in the porcelain tub? Some turn their heads to bookbinding, and say it is life dearest charm. pass them all up, thank you kindly, for the little old porcelain tub. I lost my heart to Gwendolyn that night in June so rare. her lips were like to cherries of the Maraschino kind. and plucked the cherries from her lips – under the twinkling stars. WHY DID THEY BUILD LAKE MICHIGAN SO WIDE? that two loving hearts across the lake did go. “Why did they build Lake Michigan so wide, so awful wide? Look into mine eyes, dear, am I not your bride? Answer sweetheart, answer, cast me not aside. a flat was furnished fit for any queen. and confided to his nibs her tale of woe. The question that I asked at old St. Joe? This little boon I ask of you, do not turn aside. Bathhouse John is said to have put out a whole collection, Dear Midnight of Love and Other Ballads, but I can’t find a copy. Perhaps it’s time to bring it into print as an ebook!